What do B cells and antibodies do? In fact, nothing too exotic. They can't kill anything. B cells make antibodies. Antibodies just bind to foreign molecules (proteins, carbohydrates, lipids, etc), which might neutralize their effects, such as binding to the hemagglutinin molecule of the influenza virus and preventing its entry into the cell. They also bind to foreign cells like bacteria which signals other host immune proteins and cells to come in for the kill. Antibodies are secreted by B cells, which also have a membrane bound form of the antibody on their surface. This antibody acts as a receptor which recognizes antigen and through a signal transduction process, helps to activate the B cell. Mature B cells (those that have seen the antigen before) can churn out lots of antibodies quickly. Different surface antibodies, as well as secreted antibodies, can recognize and bind to almost any kind of molecules. The first antibodies produced by the immune system are often of low affinity. Over time, high affinity (low Kd) antibodies are produced. What happens if a virus makes it into a cell? Antibodies can not bind to them anymore to prevent its entry. Something must be able to recognize a virally-infected cells and eliminate it. What about a cancer cell. Wouldn't it be nice if something could recognize a tumor cell as foreign and eliminate it before it divides to much and metastasizes? That something are T cells. 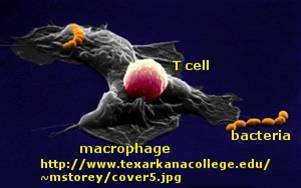 There are many T cells in a person, and many different kinds, including T helper cells (Th) and cytotoxic lymphocytes (CTL). T cells also recognize antigens but unlike B cells, these antigens can only be proteins fragments. The membrane proteins that recognize proteins fragments are call T cell receptors. In addition, they don't recognize protein antigens in isolation. They must be bound to a protein on the surface of an "antigen" presenting cell (such as a macrophage or dendritic cell). The T cell receptor recognizes and binds simultaneously to the foreign protein fragment and to the to the self protein on the surface of the antigen-presenting cells. The self protein which binds and presents the foreign protein fragments (peptides) is called a MHC protein (Major Histocompatability Complex). 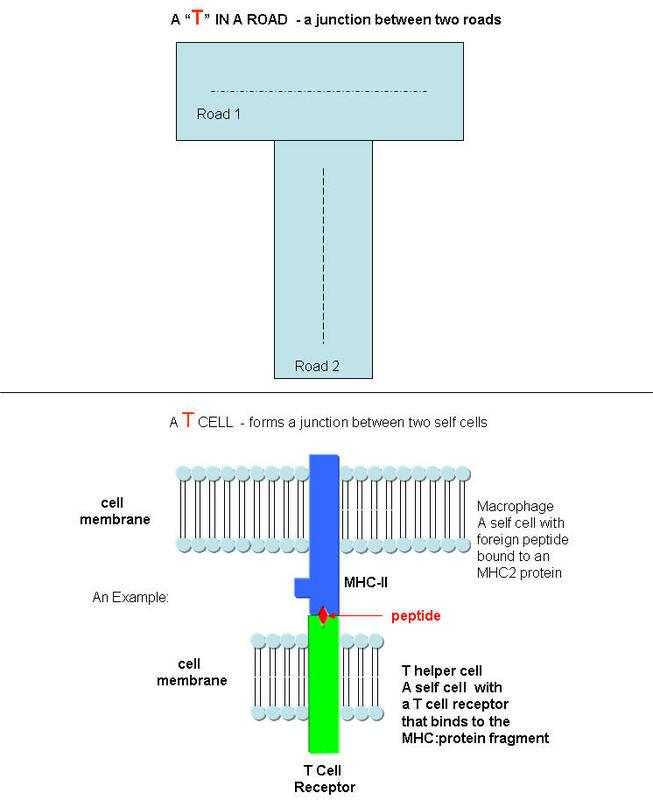 Antigen presenting cells like macrophages have MHC Class II molecules on their surface. These bind protein fragments from engulfed bacteria, for example, and present them on the surface. T cell receptors bind to the peptide:MHC II complex. Other cells in the body have MHC Class I proteins on their surface. If a cell is infected with a virus, protein fragments from the virus end up bound to the MHC Class I protein on the surface. Now a T cell can bind through its T cell receptor to the peptide:MHC Class I complex. By displaying a viral protein fragment on the surface, the immune cell can recognize a virally-infected cell without getting inside of the cell where the virus is. Sompayrac describes MHC molecules as looking like a hot dog bun. In the grove of the bun lies the peptide fragment - like the hot dog. The T cell receptor recognizes both the bun and the hot dog! 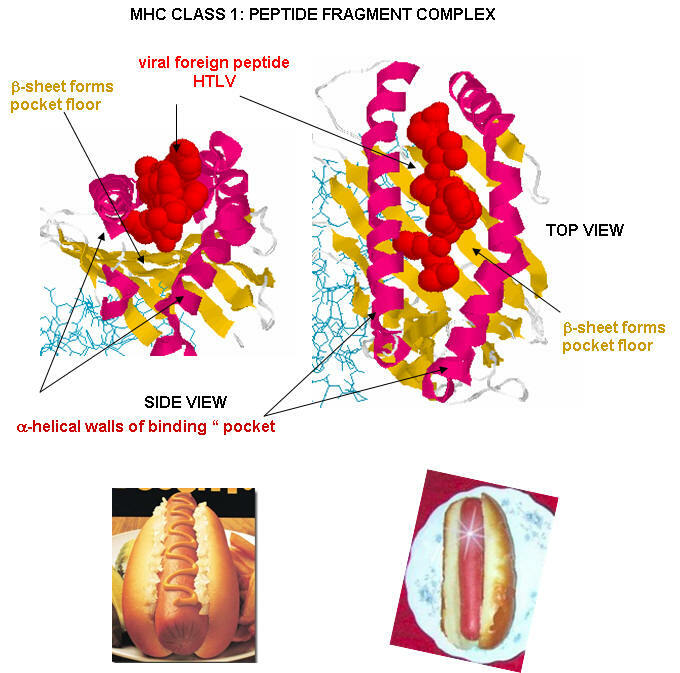 MHC Class I proteins also present "self" peptides in the binding pocket, since self proteins also are degraded in the cell by proteasomes. However, the T cell receptor does not recognize and bind to the self-peptide fragment bound to the MHC Class 1 protein. Hence T cells do not recognize self and turn against the bodies own cells. Once and a while they do, however, and autoimmune disease like MS, rheumatoid arthritis, and lupus result. B cells and T cells must be "turned on" before the can do their thing. It is important to regulate the on switch. If the cells were to be become active without need, the cells might turn against self, which would be a big problem. It turns out that it is not enough for the T cell to bind foreign peptide:MHC complexes to get activated. They must bind another protein on the antigen-presenting cell. In the case of T helper cells. a protein on the T cell, CD28, must also bind a protein, B7, on the antigen-presenting macrophage, Hence there is one specific signal (the peptide:MHC complex binding to the T cell receptor) and a nonspecific signal (B7 binding CD28). Why are two signals needed for activation? Again Sompayrac has a great analogy - that of a safety deposit box. It takes two keys (a specific key which you own and a nonspecific key (which the bank opens and which opens all the boxes) to open the box. Think of it as double security. You don't want to activate immune cells for killing unless you really need to do so. cell activation through soluble protein signals released by immune cells. The proteins are secreted by an activated cell and bind to a receptor on another immune cells, which through signal transduction processes, gets activated. These soluble protein signals are often called cytokines. 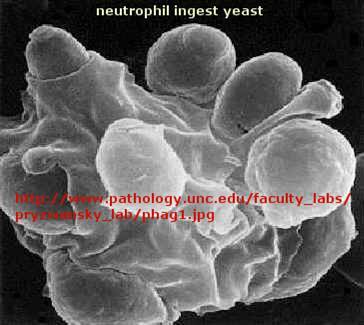 Some are called interleukins, because they travel between leukocytes - white blood cells. 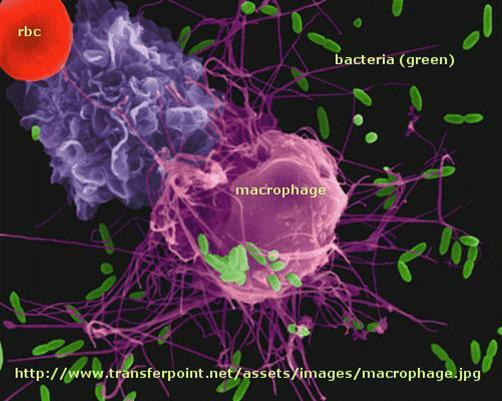 Which is more important, the innate or adaptive immune system (IS)? Modern thought tilts toward the innate IS. It posts the sentinels. It gets activated when cells detect common pathogens such as bacteria, parasites, and viruses. It then activates the adaptive immune system. We'll first discuss activation of B and T cells in the adaptive immune response, and then return to the initial event, activation of the innate immune system.